West Licking Joint Fire District through the years has always had excellent equipment and stations. In 1982, when the West Licking Joint Fire District was created, the Fire District acquired from Pataskala Fire Department the Fire Station located on Jefferson St. in Pataskala. 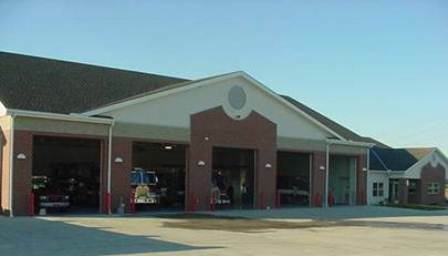 This was Station 1 until 2003, when the new Station 1 was built, located on Broad St. in Pataskala. Since 1982, WLJFD and the Village of Kirkersville shared the building located on Fourth St. in Kirkersville. Then in 1998, WLJFD bought out Kirkersville’s share, and staffed it 24/7 in 1999. Station 3 was built in 1987; it is located on Mink St. in Pataskala. In July 2016, WLJFD opened Station 4, located on Taylor Road in Reynoldsburg. Old Station 1 is located at 428 Jefferson St., Pataskala, Ohio. Old Station 1 at this point in time is utilized for storage, and a meeting place for the Firefighters Association and the Women’s Auxiliary. Station 1 is located at 851 E. Broad St., Pataskala, Ohio. Station 1 currently houses the Administration offices, Fire Prevention, shift officers, and nine firefighter/paramedics. Station 1’s equipment is: two advanced life support (ALS) medic units, one heavy rescue, two fire engines, one ladder truck, one Battalion Chief’s vehicle, and one grass truck. This station is staffed 24 hours a day, seven days a week, 365 days a year. The Administration Offices are staffed 8 a.m. through 4 p.m.; Monday through Friday, in the lower level of the fire house. Station 2 is located at 120 N. Fourth St., Kirkersville, Ohio Station 2 houses three firefighter/paramedics. This station is staffed 24 hours a day, seven days a week, 365 days a year. Station 2’s equipment is one advanced life support (ALS) medic unit, and one fire engine. Station 3 is located at 7125 Mink St., in Pataskala. Station 3 houses six firefighter/paramedics. This station is staffed 24 hours a day, seven days a week, 365 days a year. This station also staffs Fire Prevention Officer John Singleton 8 a.m. through 4 p.m., Monday through Friday. Station 3’s equipment is two advanced life support (ALS) medic units and 1 fire engine. The District operates with four fire engines that are housed at the Stations. Each engine holds many different pieces of equipment necessary for firefighting and rescue tasks. Each engine holds 1,000 gallons of water. The District has a Tower or Ladder Truck that has a 200 gallon tank and a 2,000 gpm pump. This apparatus also carries numerous types of equipment that aid the firefighters in fire and rescue situations. Another District truck is the Rescue. This truck is equipped with tools used for auto accidents, high and low-angle rescue, confined-space rescue, water rescue, and assists in fire ground operations. WLJFD equips five different Medic units. With the equipment that each Medic carries, the firefighter/paramedics can handle any emergency medical call, from minor injuries to major trauma, and heart attacks.